When Texas voted in this last election, no one did an exit poll; perhaps because it would have shown that Latinos voted for the Democrats in larger numbers than we Republicans wanted to acknowledge. The fear that Texas is turning purple is of great concern for Republicans and should be the epiphany that forces the GOP to look fear in the face: those irreversible changing demographics in Texas. It is no longer sufficient to run a candidate with a Latino surname and think that it will be enough to attract the Latino vote as voters are more informed and educated. Moreover, voters in Latino-populated communities can see that their vote is necessary to sway an election--as it happened with Romney--and they are quite comfortable in changing their vote from parties for a candidate who can bring them a sense of good conservative family values and less hateful rhetoric for their immigrant family member or neighbors. In other words, Latinos will vote for whoever respects them as voters, as Latinos, and as Americans. It appears that it will take a Latina Republican to keep Texas RED. Latinos are the growing majority in the Southwest and by 2016, they will have the plurality in the voting arena. As Texas has demonstrated, The GOP has the advantage in offering economic opportunity when addressing the Latino community. After all, it has maintained a high success rate in graduating Latinos from High School in Texas and the lowest unemployment number for Latinos than any other state. The policies in Texas have created high taxpayers and even some millionaires in the process, especially in South Texas Eagle Pass region. However, this is not enough anymore because it is the manner on how Latinos are addressed that breaks the deal, in the end. As Latinos in Texas move up in the economic ladder as a middle-class group, they want their issues addressed in a way that is civil and respectful, which are the basis of conservative tenets. Additionally, they expect politicians to speak respectfully about their fellow Latino immigrant family members or neighbors. The long-standing relationship of Tejanos in Texas is in the blood as they say. Children in the Southwest are a mix of Mexican/Anglo, Mexican/Black, and Mexican/American; the common denominator is that they are all Tejanos, and that has instilled loyalty to a State that has given them freedom, opportunity, and eventual success. Yet Latinos are about community, and they look at their surroundings and will protect their children and each other at all cost, even from many outsiders. And this is what is about to happen in Texas, unless the GOP finds a candidate, or two, who can grab the attention of that Latino voter who is certainly having a difficult time saying no to the Democrat party for the moment since they are the only Party engaged in Latino outreach. In politics, you need a conflict, an issue to champion so you can be the victor, or an issue to defeat so you can become the protector. The GOP has long been the leader which has prevailed in elections because they relied on a strong economic message that made sense to communities and their families. But something happened that stifled that message, and the demographic shift in the state frightened many in the party. As a result, in attempting to keep control of the state and political structure, the GOP abandoned the positive message and a relationship with Latinos that President W. Bush took years to build. The numbers are unmistakable. 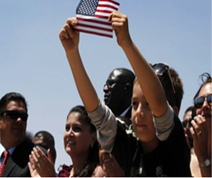 In one decade, the Latino population surged to 16% of the 310 Million population in the U.S. In Texas, the population grew by 5 million in the past 10 years, 84% of was Latino. But the GOP didn’t change its message to include new citizens into the party, it stayed in state of denial and relied on the message of the that seemed to work perfectly in the past. However, the problem with that message is that it sought to defeat a problem in the U.S. that included the Latino community comprised of citizens and native Tejanos, and which has a large number of immigrants--spouses, relatives and neighbors. Consequently, just like the Asian community, they voted 73% for President Obama in 2012. But, it wasn’t just the community of Latinos and Asian that turned from the party, it was women as well. This indicated that the messaging was wrong, antiquated, and acrid. In Texas, the House of Representatives lost three of the six Republican Latinos and one Congressional member (Canseco) during the 2012 election. And Republicans lost a total of six House members. But what is amazing is that the party is still absent of women, more specifically Republican Latina Representatives. If Texas wanted to lead in keeping its dominance, it should look to a woman and preferably one who is Latina. Florida has Senator Marco Rubio who appeals to the young, women, and minorities proudly--he is proud of his Cuban roots. However, in Texas he has only a slight lead in the GOP and among Latinos. If there is a fear of having Hilary Clinton take the lead into the 2016 Presidential race, the shift in Texas from Red to a Blue could now be a reality If the GOP does not move to out maneuver this deluge. And even the Chairman of the Republican Party of Texas recently told Real Clear Politics that “If she’s the nominee, I would say that this is a ‘lean Republican’ state but not a ‘solid Republican’ state,” the women challenge is tangible problem for the GOP. Currently, Texas has a population of 26 Million: 11 million Anglo, 11 million Latino, 3 Million Black, and 1 million other. Age groups of 0-4 and 25-34 have 20 million people, which means that the voting issues for these groups are going to center around education, economics, and immigration, possibly in that order. However, if one of these issues is addressed in a negative matter, it is almost with great certainty that the GOP will lose more candidates and power, if their message is not modernized with Positive Conservative themes. Moreover, if the GOP can manage to find a viable strong Latina Candidate by 2016, when the Latino population in Texas will be at 12 million versus the 11 million of the Anglo population, it will not only capture the attention of the Latino voter but also the female vote that is certainly to gravitate to the GOP with a fresh perspective other than the usual white male candidate. Thus, a female candidate, much like Gov. Susana Martinez, will speak to the issues of women in education, jobs, the economy, and Latinos. These are the issues that have made Susana Martinez one of the most popular governors in the nation. Currently, Gov. Martinez (R) boasts a 69% popularity in a highly Democrat state. The Texas GOP should take the chance in seeking a viable Latina Candidate for a State Office where the masses of Latino, young, and female voters see themselves. Essentially, a Party not only for “old white men.” As the time changes, the demographic advantages of the Latino Community should be an asset for the GOP. The predictable stale messaging of the GOP party needs a boost if it intends to remain in power for longer than the next presidential election. As the current Texas legislature has only 3 Latinos in office, the Party should step out of its comfort zone and attract, invite, groom a Latina candidate who can save the Party. Given that the opportunity is slipping away as the Democrats grow in numbers, what is keeping that party from acting on this idea? If it’s fear now is the time for the GOP to be bold and act because if it doesn’t, Texas may shift in power come 2016, and once it does, it will take decades to bring it to the RED side again.